She gave up acting to write for teen magazines, and became a television producer. In 1985 she formed a public relations company with her husband, Rick Splaver, representing clients such as Pixar, and also volunteered to aid senior citizens with the Motion Picture and Television Fund. At the time of her death, Steffi was reportedly working on a memoir, wittily titled Once Upon a Time in Hollywood by the Daughter of the Man Who Gave Oscar its Name. “I met Steffi and Rick shortly after they moved to Langley in 1998, and always enjoyed my time with the two of them. The stories of Steffi’s childhood and life in Hollywood were always welcome, and I loved looking at her large collection of black & white photos, especially those of her attending such events as child star Shirley Temple’s birthday parties at the Fox Commissary. Sidney Skolsky, Steffi’s father, worked from an office at Schwab’s Pharmacy and Diner, a hangout for young actors. One of the most glamorous stars of Hollywood’s golden era, Lana Turner, was reportedly ‘discovered’ just outside the drugstore in 1937, drinking by the soda fountain. A decade later, Skolsky was one of the first Hollywood players to champion another blonde starlet, Marilyn Monroe. Over the course of her career, Marilyn counted Skolsky as a confidante. Quoted in actress Susan Strasberg’s 1992 memoir, Marilyn and Me: Sisters, Rivals, Friends, Steffi recalled observing her father’s unusual friendship as she grew up in Los Angeles. ‘My father had a good eye,’ Steffi commented. ‘He’d picked out the unknown Betty Grable and Carole Lombard. ..Marilyn was special. People suspected hanky-panky between them, but he always looked on her as a daughter.’ Skolsky, a nervous man, refused to learn to drive, and so Marilyn would often chauffeur him across town. However, there was a darker side to their relationship. ‘My father knew every doctor in town,’ Steffi recalled. ‘He was a hypochondriac who knew every pill manufactured. Marilyn would call him up for recommendations of doctors.’ In the final years of her life, Marilyn fought and was ultimately destroyed by drug addiction. It was Steffi who first introduced Marilyn to the young Susan Strasberg in 1954, on the set of There’s No Business Like Show Business. In a revealing, Carmen Miranda-style costume, Marilyn was filming an Irving Berlin number, ‘Heat Wave.’ Her then-husband, sportsman Joe DiMaggio, was also present and clearly uncomfortable at seeing his wife performing a risqué dance routine. Of course, this flair for hyperbole made Skolsky a highly successful journalist, and many of the earlier, more Dickensian accounts of Marilyn’s life were dreamed up by her and Skolsky – he wrote her first published biography in 1954, and hoped that she would star in a film project of his own about the life of her childhood idol, Jean Harlow. Unfortunately, this latter collaboration never materialised. Steffi later told Monroe’s biographer, Anthony Summers (in his 1986 bestseller, Goddess: The Secret Lives of Marilyn Monroe), that Skolsky had insisted that she listen in to all his telephone conversations with Marilyn. 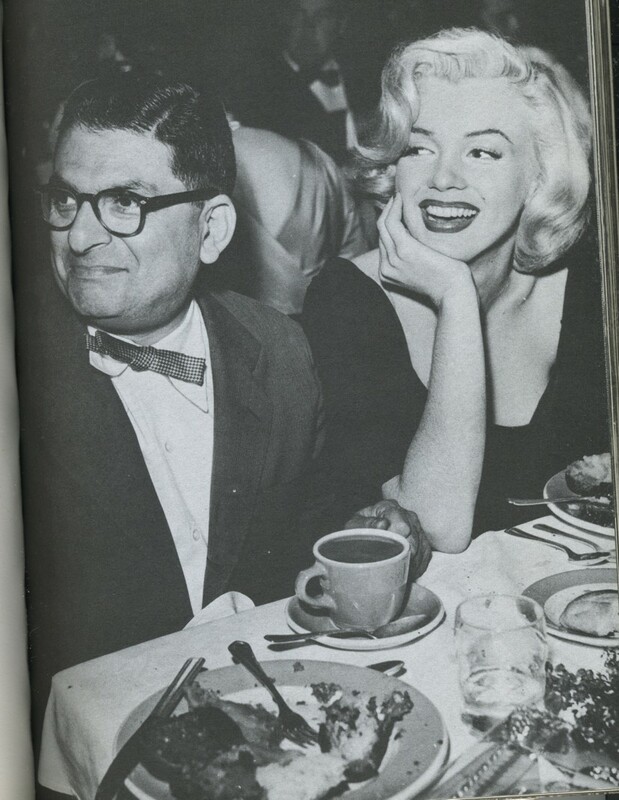 Skolsky would call Monroe regularly as he did with other stars, but he never asked Steffi to listen in on anyone else. Perhaps Skolsky worried about Marilyn, who like him suffered from depression. I just happened to do a search on Steffi’s name and was saddened to hear she had died. I talked with her a few years ago and she was moving from Los Angeles. Her phone was still on when I phoned and got her. She said I was lucky to get through to her. In my book THE GOSSIP COLUMNIST she had given me a photo of her, Dennis Hopper and Susan Strasberg. I gave her photo credit and wanted to send her a copy of my book. I loved her father’s writings. I guess most of the James Dean gang are now gone.